23 March ORTOPROFIL presentation at MACRo 2011 Industrial Realiy! 20 March DIGILENT presentation at MACRo 2011 Industrial Realiy! Registration form submitted on the conference website. Participants must electronically complete the registration form and send it by email to macro@ms.sapientia.ro, before 31 March 2011. 8 March 2011 Notification of acceptance sent to authors. 15 February 2011 Paper submission extended to February 20, 2011. 15 January 2011 Best Paper Award announced. 20 December 2010 MACRo 2011 paper submission opened. 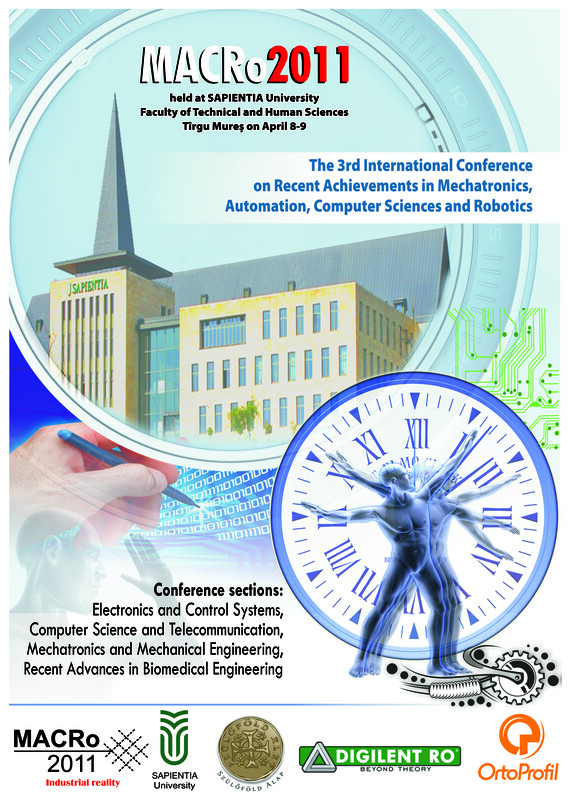 Please submit Your paper at the following link: http://macro.ms.sapientia.ro/submitpaper/openconf.php. 4 December 2010 MACRo 2011 Call for Posters announced. Download Call for Posters. 3 December 2010 MACRo 2011 Call for Special Sessions announced. Download call for Special Session here. MACRo 2011 is included in Konferencia kalauz. See here. MACRo 2011 Special session - Current Advances in Biomedical Engineering announcement posted on website. MACRo 2011 VISA information posted on website. MACRo 2011 is included in as Conference # 72368. MACRo 2011 is included on as Conference # 12241.